A stand will help you keep things organized when shaving, something that is of incredible help when you are in a hurry. 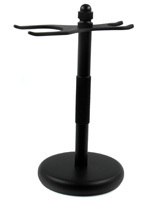 What’s even better, a stand will keep your items in great condition totally free of rust, bacteria and/or mold. This means your blades will last much longer than they used to now that they are drying up properly. You will see that the best safety razor stands also have space to accommodate most brands of shaving brushes. The stand will ensure there is proper ventilation with no water pooled on the handle, and it also helps the bristles dry straight as they should. If you are looking to buy a good shaving razor stand, look no further, here we take a look at the top shaving razor stands in the market, as well as the different factors you need to look for when shopping for one. No rust or rotting. A top quality stand won’t be ruined with water, they are meant to work surrounded by it! In the case of metal stands, they should not develop rust, and in the case of wooden stands, it must be a type of wood that can stand humidity. Hardwood is a great option! Sturdiness. A good stand must be sturdy and have some weight, so that you can easily organize your shaving items without worrying about it falling over. Rubberized sole. These types of soles will help you keep accidents away. Any competitor for the best safety razor stand medal must have this feature, because we are always shaving in the midst of slipper surfaces! Look. Every stand has its own style that may or may not fit yours. As you have seen we have many alternatives for stands including those made of chromed finish, wood and matte material. It must look good not only in the photo but also when you have it on your hands. This is a classic, chrome-finish stand, perfect for those of us who prefer a really classic look. This stand fits most models of razors and brushes, with a brush slot width of 1” and a razor slot of 5”. What sets this stand apart from other alternatives in the market is that it is completely rust-free. I’ve owned one of these stands for about a year and there is not a sign of rust in any part. It has nice weight to hold your shaving gear and a non/slippery surface to avoid bathroom accidents. This is another great classic alternative to store your razor and shaving brush. Its weighted base gives it stability and the rubberized base prevents it from slipping. In addition, there is a texture in the middle of the post which helps you grab the whole stand securely. 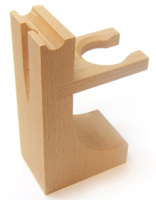 This safety razor stand can easily by taken apart by unscrewing the post from the base of the stand. This doesn’t only help you clean it properly, but it also helps you save space when traveling. If you have something different in mind, you can get this shaving brush and razor stand, made entirely of hardwood! This type of wood does an excellent job resisting rotting and comes with a light honey fish that looks pretty cool. As you can see, it is a simple yet functional design. Instead of hanging the razor upside down, you put it sideways on the top recess. The brush is hanged to dry completely during the day. The stand is compact and can fit in small spaces. It looks really cool in a wooden-style bathroom. Of all the black safety razor stands in the market, this is the one with the best quality. It has a nice finish and doesn’t look cheap or shiny like other products in the market. What’s better, it won’t rust even after years of use. A black safety razor stand looks nice in any bathroom, giving it a modern, yet classy look. This best safety razor stand has a good weight and a rubberized sole which makes it non slippery.